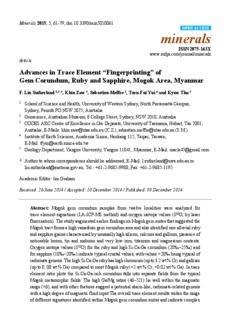 Mogok gem corundum samples from twelve localities were analyzed for trace element signatures (LA-ICP-MS method) and oxygen isotope values (δ18O, by laser fluorination). The study augmented earlier findings on Mogok gem suites that suggested the Mogok tract forms a high vanadium gem corundum area and also identified rare alluvial ruby and sapphire grains characterised by unusually high silicon, calcium and gallium, presence of noticeable boron, tin and niobium and very low iron, titanium and magnesium contents. Oxygen isotope values (δ18O) for the ruby and high Si-Ca-Ga corundum (20‰–25‰) and for sapphire (10‰–20‰) indicate typical crustal values, with values >20‰ being typical of carbonate genesis. The high Si-Ca-Ga ruby has high chromium (up to 3.2 wt % Cr) and gallium (up to 0. 08 wt % Ga) compared to most Mogok ruby (<2 wt % Cr; <0.02 wt % Ga). In trace element ratio plots the Si-Ca-Ga-rich corundum falls into separate fields from the typical Mogok metamorphic fields. The high Ga/Mg ratios (46–521) lie well within the magmatic range (>6), and with other features suggest a potential skarn-like, carbonate-related genesis with a high degree of magmatic fluid input The overall trace element results widen the range of different signatures identified within Mogok gem corundum suites and indicate complex genesis. The expanded geochemical platform, related to a variety of metamorphic, metasomatic and magmatic sources, now provides a wider base for geographic typing of Mogok gem corundum suites. It allows more detailed comparisons with suites from other deposits and will assist identification of Mogok gem corundum sources used in jewelry.